Welcome to our Australasian Stamp of the Month Blog Hop! If you have come here from Megan's Blog, you are on the right path! The blog hop is a great big circle, so you can start here and work your way all around. The April SOTM is this Love So Sweet, featuring some pretty butterflies and delicate floral images. I really wanted to challenge myself to use the butterflies as they aren't usually my thing, so I took inspiration from the colours of the Feels Like Home Paper Packet and used the smooth side to rock and roll stamp the butterfly shape in Lilac and Sugarplum, then turned the stamp set over to outline the details in Black ink. The sentiment is also from the stamp set, and I used second generation Fern ink for the branch across the bottom of the sentiment rectangle. 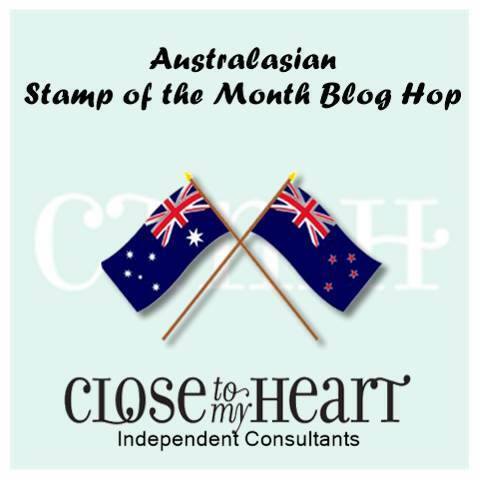 Now "Hop" on over to Doreen's Blog to see her work! Be sure to visit all the Consultants at their Blogs to get some great crafting ideas and other fun ideas! Remember, the April SOTM is only available until the 30th April! Love your card, Lauren. Butterflies are totally my thing! A really sweet card, love the colours in this collection. Love this technique of using the back of the stamp to create the "shadow" & loved how you incorporated the idea into this card. I love the butterflies. I like your technique too. Looks great.